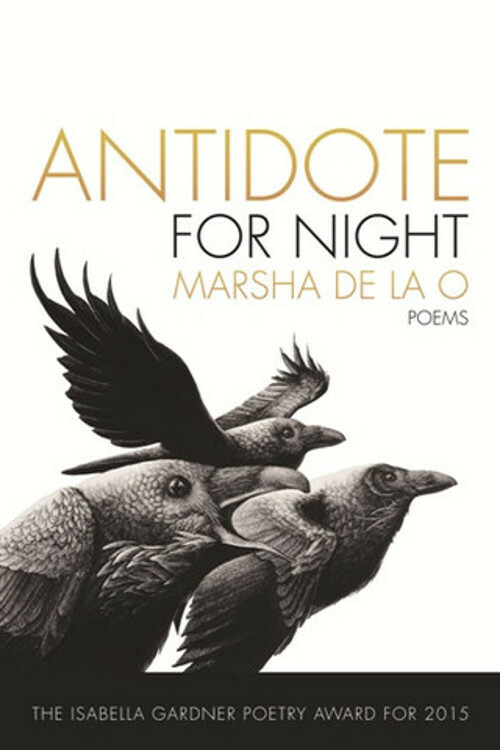 Antidote for Night, by Marsha de la O. Rochester, New York: BOA Editions LTD, September 2015. 104 pages. $16,.00, paper. Poetry is no easy way to understand why we are here on this planet; . . . A poet achieves the essential on the page, for a moment, and then that moment is gone. As a UK transplant, I’ve lived in California since 1987, mostly Southern, with a seven-year swerve for graduate work in San Francisco. Whereas San Francisco is easy to love, Southern California, and Los Angeles itself, often generate ire and scorn: the beaches and shopping malls, the endless selfies and self-promotion, the earnest preoccupation with tanning, and an innocent, wistful longing for spirituality-lite, a mash-up of the Beach Boys and Krishna Das. I’ve gone through conflicting mindsets: from sharing the ire and scorn to succumbing to gym memberships and yoga, to an appreciation of the gob-smacking natural beauty of Highway 1, Angeles Crest Highway, Joshua Tree, and Death Valley. I’ve also developed a love of driving on the 110 South between two and four a.m., when the freeways are relatively free and I can enjoy that surging sculpture of downtown Los Angeles. And this is what draws me to Marsha de la O’s precarious and vulnerable nightscapes in Antidote for Night, where she slips her scalpel beneath the slippery patinas of Southern California, flaying away media exaggerations to reveal the beauty and the bestial. In “Passing Hyperion,” de la O presents Los Angeles in a luminous neon palette. On a night drive with her father, the city snaps like a pop-up book: sound, color, texture bespeak the “fools’ paradise.” Landmarks slide by simultaneously familiar and strange to anyone who’s driven through downtown LA. For those who haven’t, it is clearly the trope of city, known and unknown, morphing into a new after-hours landscape. It invites readers to examine what they actually know about what they think they know, being brought to recognition of self and place. But don’t be deceived by the insightful, delicate language. There is rage here. She raises a howl for the lost kids. Southern Californian or not, we all recognize Ramon, the legend of gang fights, who vanished—a victim of yet another unknown, unmarked fight (“Nobody Knows”). Any teacher will recognize Sanchez, and the “way he bore pain / with dumbfounded dignity” (“Sanchez”). Antidote for Night plunges into those other types of night: of loss, of crushed hope, endless, eye-searing, raw. Specific memories evoke the Spartan. De la O can flip an image on its elbow and then reshape it. She describes “a Chinese lantern with red tassels / a kind of three-story castle clinging upside down / to the roof of heaven” (“Chinese Lantern”). The metaphor exactly captures the lantern, and the line break stops readers at one unexpected image before leading to the next. Later in the poem, the hanging castle image abruptly skews sideways when it becomes the pregnant stomach of her friend, “Sway-backed / and swag-bellied,” who once occupied the “high throne of high school.” The reader’s sense of normalcy, even of gravity, is overthrown, and that precariousness comes home with the pregnancy of the high school queen. In a poem that recalls Michael Ondaatje’s Coming Through Slaughter, the competition between the trumpet players and Louis Armstrong is jeweled with aural moments, “… a rocking motion which begets a pulse which begets hot” and “the first wobbling notes, valved longing, a woman leaning into a man, / held up only by music, breath .…” De la O propels us into the moving sweat and sensuality of music, where Armstrong, held up by pain and anger, unleashes his genius (“Whistle Keeps on Blowing”). Often, spare imagery leads to exposed, hushed anguish: “all the time, that little bundle of dark water, that stone / wrapped in swaddling cloth I crouch above half- / bent and try to hush because my mother taught me / how to pass into silence” (“That Stone”) The language is palimpsest, outlined with feather strokes, but the pain is tangible, and the cerement of language leads to the rotting truth. In “Biscuit, Ingot, Spirit,” the words are pulled apart as though escaping from each other and ought to be—and can be—read in two columns. “As a pine marten might wide eyed / as a mummer in a jumble of vermilion.” There are long breaths here, the discovery of “a muckle of marvel.” Again, de la O uses startling juxtaposition that brings the reader into the astonishing quiet violence of birth. There is generosity and compassion, too. As much as the poems reveal the past, they connect to the present—how we carry our parents’ past with us. While the deceased mother’s plans, to cook various lemon recipes must stop, the tree “goes on unceasingly—lemons fall / and fold into the earth and begin again.” The mother’s death leaves a gift, a persistent trace in a simple gesture: cupping the hands. One of my favorite poems, “Murmur,” ends the collection. It begins with a cat slinking into the twilight, mirroring the narrator’s own “solemn eyes.” We eat the essence of a Southern California snack meal: melted cheese on bread, papaya, and black coffee, and are drifted into that instantly recognizable warm summer night: “… the wind leaves me whole, / easy to say yes to the monsoon sliding up from Mexico / In a musky velvet gown.” In this moment, there is hope: “it all comes down to air” and reconciliation, “… breathing / like a champ, like I loved my own lost self all along.” The moment is a loving affirmation and is memorable, persistent, endless. Antidote for Night contains the pain and random savagery, the searing beauty of the external and internal world, the endurance of motherhood, the loss of children, the sad diminishment of parents—and hope. Keep this book by your bed to ensure those essentially brutal and beautiful Southern California dreams. Sandra Hunter’s fiction has been published in a number of literary magazines and received the October 2014 Africa Book Club Award, 2014 H.E. Francis Fiction Award, 2012 Cobalt Fiction Prize, 2011 Arthur Edelstein Short Fiction Prize, and three Pushcart Prize nominations. Her debut novel, Losing Touch, was released in July 2014 (OneWorld Publications). She is currently working on her second novel, The Geography of Kitchen Tables.